Goldfish originate in Asian fresh water sources such as cool streams, rivers and ponds. They are also omnivores, which mean they eat anything and everything. In the wild as well as in tank conditions, goldfish graze and eat continually. Nevertheless, this appearance of hunger should not be recognized as starvation. While it is unlikely that a goldfish will starve to death, some situations occur when a goldfish may not be feeding or is incapable of feeding due to illness or pecking order. Determine if your goldfish has a healthy appetite. Goldfish should be able to hungrily eat all the food they need in two minutes. Feeding more than this amount causes imbalances in the water that result in illness and loss of appetite. Determine if all of your goldfish are eating during feeding times. Goldfish that have handicaps (large fins, bubble eyes) are pushed aside by goldfish that are stronger and more dominant, which can result in smaller fish starving to death. Examine how you feed your goldfish. Dry flake and pellet foods swell after being ingested causing intestinal blockages. Instead, soak commercially prepared pellets and flakes before feeding for best results. Examine how often you feed your goldfish. Goldfish do best on three to four small feedings a day rather than one or two large feedings. Determine if your goldfish has nutritional deficiencies or an illness that interferes with its eating habits. Fish that are bobbing or have buoyancy problems are unable to feed properly. Ensure that your fish has clean water. Goldfish require clean, cool water of about 67 degrees F that is filtered and changed regularly. The likelihood of illness and loss of appetite increase when ammonia levels increase. 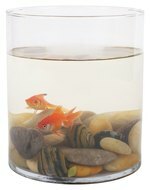 Determine if your goldfish requires more water space. One goldfish needs approximately 6 gallons of water to live comfortably. Determine if your goldfish has adequate hiding vegetation. Goldfish are prey animals and will not swim the tank to feed if they feel threatened or vulnerable to predators.